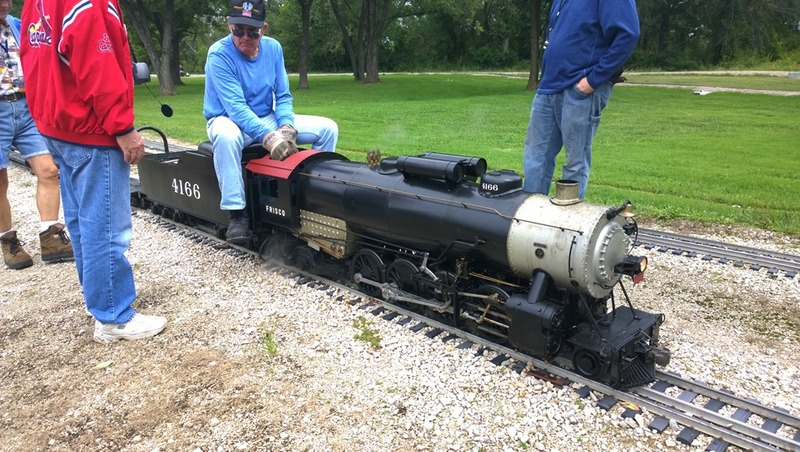 A 1.6” scale live steam locomotive is heavy, large and contains a lot of parts. And lets face it, the castings and components supplied by the live steam cottage industries are not inexpensive. So the builder has to decide which path to take acquiring the necessary parts. The first path is that they purchase the parts as they are needed. The advantage being that cost is spread out over time and you reduce the risk of buying items that you won’t use. The inherit risk being that you could get part way through a build and the supplier you are relying on suddenly disappears from the vendor landscape. That was my biggest concern and so I decided to take the alternative path of trying to buy everything up front that I could that was either single sourced, unquestionably required or had limited availability. Unfortunately that includes almost all the the components that I would need except for the largest purchase, the boiler. It would be best for me to wait until I had something close to a rolling chassis that I could use to come up with the correct dimensions for the boiler. I figured a boiler would run $7000 or more so delaying that purchase was also financially beneficial. There are at least choices in boiler vendors. So I started to compile a list of what I needed along with potential sources. I knew of no vendor that supplied a set of castings for a 4-8-2 mountain class similar to the 1522 so I going to have to kit bash as much as I could. My initial thoughts were to start with the Little Engines Pacific castings and stretch it out. Mike Venezia from Little Engines is just awesome to work with and I do regret not using more of his casting because of that. At one point I was about to throw-in the towel on getting the right castings for the 1522 and was very serious about building the Alco Hudson from Mike. The main problem with the Little Engine’s Pacific were mainly its 1.5” scale and large driver size. I really wanted to build in 1.6” scale given that I would be running on 7.5” gauge track and the 10” drivers of the Pacific were almost 1” too large in diameter. My local club, St. Louis Live Steamers, has two members that have Railroad Supply heavy Mikados. The Mikado pictured is near completion and is being constructed by Denis Neidrauer and Bill Webster. It was instrumental in my decision to look at the Mikado’s castings. This locomotive had a lot going for it in terms of similarities to the Frisco 1522. The prototypes for both were similar sized locomotives built during the same time period and were constructed in a very similar fashion. After looking through the Mikado plans from Railroad Supply I determined I could use roughly 60% of the parts including the more complex items such as the cylinder castings and delta trailing truck. The Mikado is a wonderfully designed engine developed by Railroad Supply back in the 1970’s when Chet Peterson was in charge of it. The kit can be built into a very realistic model. One of its highlights is the set of construction drawings that were hand-drawn by Jim Oetting. They are beautifully executed, easy to read and contain a lot of information. My main concern with choosing the Mikado was vendor related. The original Railroad Supply Corp business was sold over time and it seems that somewhere along the lines the Mikado patterns and inventory were sold separately and ended up in the hands of Railroad Warehouse. If you search around on the Chaski live steam forums you will find several folks that have dealt with both Railroad Supply Corp and Railroad Warehouse and you will find very mixed results with both of them. Additionally, my local club members were equally concerned with working with either vendor. Since I was going to be spending many thousands of dollars on the set of castings I was nervous to say the least. I originally contacted Railroad Supply because it was my understanding that Railroad Warehouse would not sell partial kits but it quickly became evident that Railroad Supply was not in possession of the casting patterns and while they were working on building new ones, I was not in a position to wait for that period of time. So I reached out to Bob Perdersen owner of Railroad Warehouse, told him what I was trying to build and what I wanted to purchase and verify whether I could get what I needed from him. I will say that this has been my only dealing with Bob but it was an absolutely great experience. He responded very quickly with the price list and after a conversation over the phone was very willing to sell me whatever I was looking for. I sent him a list of the castings and he quickly responded with a quote. His quote also included a photo of all the castings laid out on a table with my name and the date written on a piece of paper along side them as proof that he truly had them available. I didn’t ask for this but it sure boosted my confidence that I would be able to get the parts. 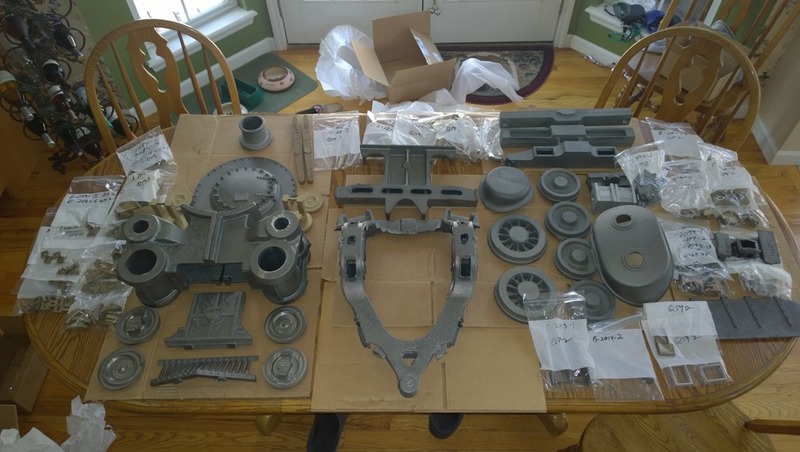 He had 4 casting that were at the foundry to be poured in the next couple weeks and right in step I received an updated photo with the new castings sitting with the other parts. He even sent me photos of the boxes ready for shipment, a list of every part and which box it was in, the weights of the boxes and the tracking numbers. I sent a cashier’s check FedEx and had the boxes sitting on my table as seen in the photo 5 days later. Now I was sure I could proceed with the Frisco 1522. I still was missing some important items though. 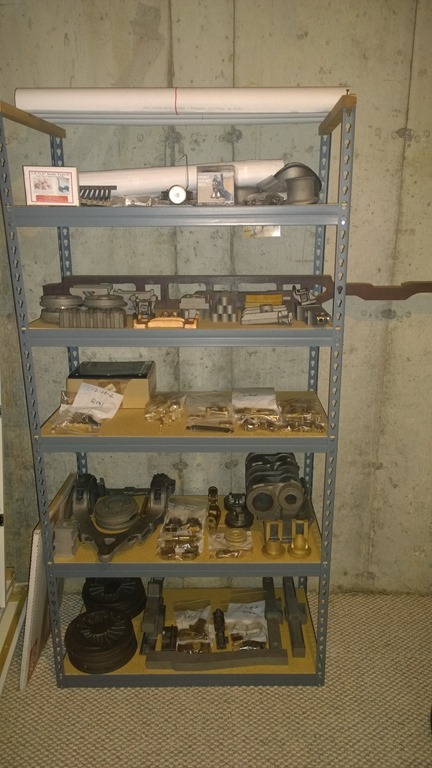 I contacted Mike at Little Engines and bought the pilot truck components I needed. Mike’s transaction was, as always, perfect. I also needed drivers. The drivers for the heavy Mikado are too small with a diameter of 8-5/8”. As mentioned earlier, the Little Engine’s Pacific drivers are too large. The 1522 has 69” drivers when scaled down come out to 9-3/16”. 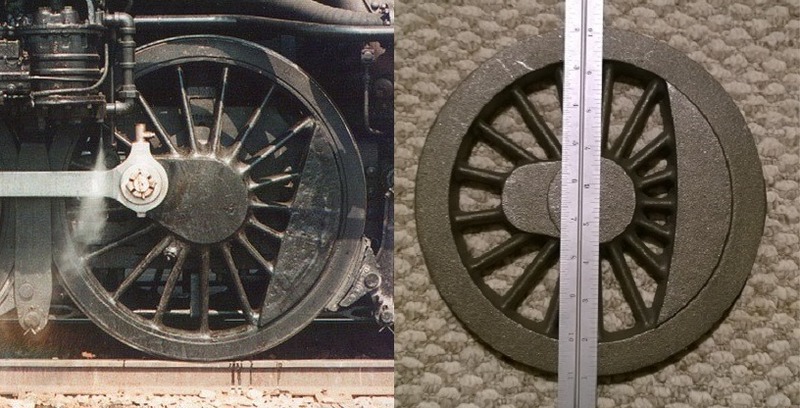 I was happy to find that Real Trains had drivers with the right amount of spokes that were a little over 9” in diameter. The counter weight would need some modification as the 1522’s counter weights are flat across the hub-side edge instead of curved but I could probably deal with that. The spokes sure look spindly on the prototype compared to the casting. If the outside diameter is found to be too under-sized I will just turn them down and add steel tires like the prototype. I may do that in either case. Real Trains also carries the Laird style crossheads that I needed beautifully cast in bronze in 1.6” scale. Score! The remaining big item was the frames for the locomotive and pilot truck. I was going to have to have these custom made. I had the erecting card of the 1522 which showed the frames in detail so all I needed to do was find someone local that could cut them out for me. Fortunately I found David Klos at All-Cut who has cut similar parts for another club member. He can cut all kinds of materials and steels up to 8” thick. I drew the frames and some other components such as frame spreaders and brake hangers that I needed and he quickly returned a quote and I had them two weeks later. Now that all the big items were in hand I could worry about the small items. Many of them have been sourced but I still have some on order and obviously there will be more components needed over time but I definitely have everything necessary to start. I’ve included a list of parts and their respective vendors in the references listed to the right. Now I just need to put my machine shop back together which I had emptied out in order to paint the floor and then I can start making chips. I really can’t wait to get started.